When you write for the world's most popular pie based, light entertainment website there are many things that can keep you awake at night. Trying to make our reviews consistent and maintain accuracy after 6 years of pie reviewing is one of those things. It's like trying to herd cats (albeit very tasty cats). You look away for one moment and a company will have changed it's range or updated it's flavours. I have nightmares about sending someone to eat a pie which is perhaps not longer as good as it was when we visited. I see their scornful faces asking me how I could have got it so wrong. Worst still, what if one of the pies on our list is no longer in production. I would feel terrible to send someone on a wild goose chase for a pie which doesn't exist. (Note to self, why have I never tried wild goose pie?) 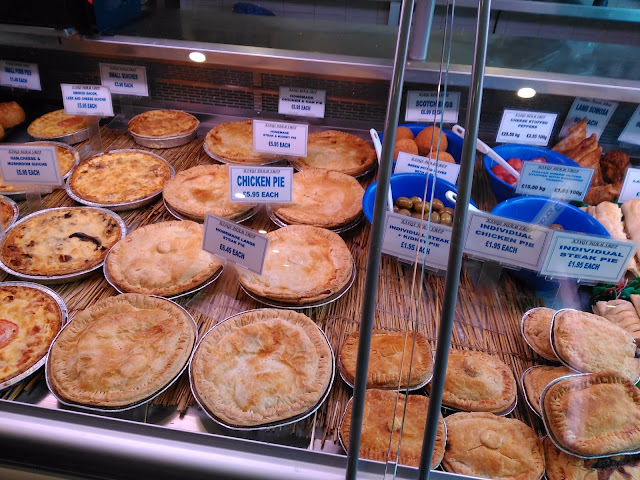 Even if the companies themselves have done exceptionally well to maintain a consistent product, after having reviewed over 500 pies we now have quite a lot more pies to compare against than we did to start with. In some cases this probably means we need to revisit some of our early scores to re-benchmark them against the latest competition such as MyPie, our favourites of last year. In all seriousness, we do take our pie reviewing seriously as we know what it can mean to the pie producers to be crowned as a Pierate Highly Recommended pie. We might not quite be the kingmakers but it won't harm a business to have our recommendation. Unfortunately we just don't have time to go back and review all the pies again and we wouldn't want to, there are so many new pies out there! However there are some cases where it feels particularly important to carry out a repeat review, such as those near the top of our pie rankings. Or in some cases, we regularly eat a particular pie anyway and hence to do a repeat review is that much easier. One such pie is the Steak pie from Kings Farm Shop, near Wendover in Buckinghamshire, which was previously reviewed in 2010. I have recently eaten a few of these and it seems appropriate now to revisit the review given that it was almost 6 years ago. Back in 2010 I gave it a huge 6.7 out of 7, sending it to number one in our rankings for quite some time. Is it still as good as I remember? I hadn't had one for a couple of years. I was slightly nervous, when expectations are high it is easy to be disappointed. I am pleased to say that the Steak pie is still very similar to how it always has been and is still an excellent pie! Not a lot has changed really, it still looks very much the same with a rustic, handmade look and a thick crimped, overhanging edge (although if you do a spot the difference, this one doesn't have fork imprints on the crimp). One thing definitely has changed though over the last six years and that is the price! From £5 for a large steak pie to £6.45 seems to be an inflation busting price increase which could affect the score slightly. However, it does still feel good value for money, the pies are still packed with steak chunks and are certainly big enough to feed 4 normal people or 2-3 Pierateers. I still find it difficult to stop at one slice! The rich, meaty, thick sauce is very effective, with ample amounts so that additional gravy would be boarding on foolhardy. The pie is still packed with tender chunks of steak. Having now tried so many other steak pies, I realise how simple this pie is. It doesn't try and do anything unusual, but it does the little things so well. Something I have found is that the versions which come frozen tend to be the best and their staff seemed to share this opinion. Re-heating the pre-cooked version has a tendency to make some of the pastry quite crunchy, sometimes verging on too much crunch. If I had to be critical, the pastry crimp can be a bit large, which can detract, particularly from the individual sized pies, which are consequently a bit pastry-heavy. Also, perhaps it is a bit too simple compared to some other Steak pies we have tried, such as MyPie and Paul's Pies. Maybe it takes more for a pie to standout having reviewed so many now. But overall it is hard to find much fault and the Steak pie is still deserving of our Pierate Highly Recommended award. This time I am also going to review a Chicken Pie from Kings Farm Shop, the first time I have tried this particular pie. At £5.95 it is a bit cheaper, which makes sense given that Chicken is much cheaper than Steak but oddly a price difference between the different flavours of pie is quite rare. Much like the Steak pie, this is simple, wholesome food. It isn't Chicken and Ham, it isn't Chicken & Asparagus, it is certainly not Chicken & Earwig or whatever the next random pie will be that tries to be super weird just to standout. It is just chicken. There in lies it's strength but also unfortunately some weakness. Whilst it is nice that it doesn't over complicate the contents, there perhaps isn't enough in there to give it much flavour in this otherwise excellent pie. The appearance is similar to the steak, if anything slightly too rustic in appearance but charming nevertheless. The chunks of real chicken sit in a thick gelatinous sauce. This doesn't stop it being a delight getting your teeth stuck into this pie, given that the pastry is still delicious and there are so many chunks of meat. But you can't get away from the fact that it lacks the strong meaty flavours and great balance of seasoning that the Steak pie has. Still a pie I would recommend. Not a pie I would often buy given that the Steak pie sits next to it on the shelf. P.S. Looking back on the original review from 6 years ago does make me appreciate how time flies. Back then we had reviewed less than 50 pies. I talked about how this was one of the first times I had experienced bad heartburn. Now we are over 500 pies reviewed and heartburn has now become a familiar companion over this epic pastry fuelled journey!